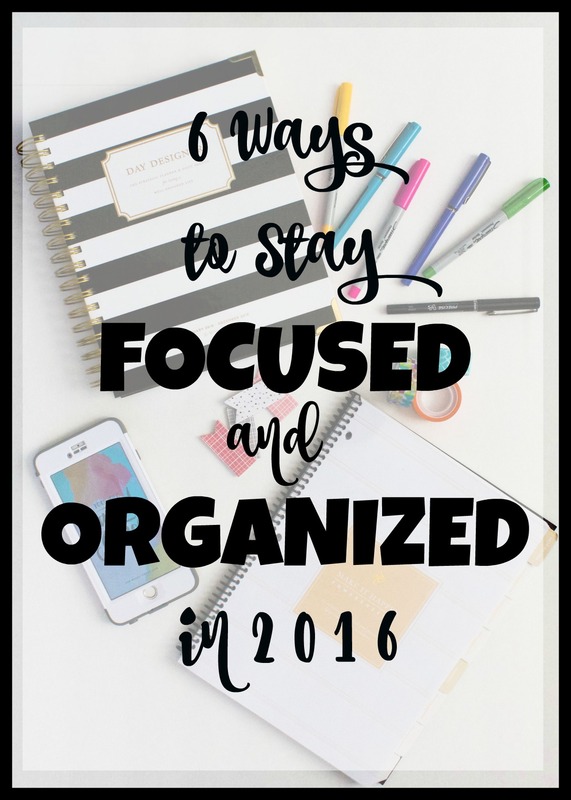 I don’t know about y’all, but I need some good tools when it comes to keeping me focused and organized. This past year was chaotic to say the least, so I’m excited about staying on top of everything moving forward and really honing in on what it is I hope to accomplish. There are amazing things on the market that can help you with staying organized, focused and making sure you hit your goals. I thought I’d share with y’all my 6 favorite things that are helping do just that in 2016. Whitney English Day Designer : This is my first year using the Day Designer and I have to say, I really love it! It’s super sturdy and a larger planner. I love that it has the month view but also has a full page devoted to each day, as well as an hourly breakdown. It’s definitely aiding in my to-do list being checked off every single day. Bright markers & pens : I love an amazing pen or marker! Color coding is just another way to keep me organized and these help me do that. Fun sticky flags : I use these for everything…my planner, calendar, cookbook, you name it! If I want to be sure not to miss anything, I flag the page with these handy little things and then write down whatever I need to on the tab. She Reads Truth App : One of my goals this year is to read through the bible. This app is helping me do that, along with some sweet friends who are keeping me accountable. My cell is so easily accessible and so is this app! I love that it’s so user friendly and gives me the bible and a daily study within a tap of a finger. I’m making a conscious effort to start my day in the word so my focus is in the right place as I begin my morning. I love “The Bible In a Year” plan that She Reads Truth offers for free. It’s making reading the bible front to back so easy. Washi tape : Just another thing that brightens up my planner! If I need to highlight an event for a week, I stick some of this tape on it and jot out whatever is going on. It’s colorful and helps keep my lines straight, which I LOVE and helps keep me focused on our schedule. Lara Casey Powersheets : I love Lara Casey and this is amazing tool that she’s created! These powersheets are so motivating at helping you plan and set goals for yourself. There are inspirational quotes that trickle throughout the sheets as well. It’s a 6 month set of powersheets that come hole-punched and I just took mine to Office Depot to have it bound. I bought this set last year and devote the time into my planning. So, I’m really excited to use these this year and for them to be able to help me achieve the goals I have for myself in 2016. I am so excited about this year and all that it will bring. 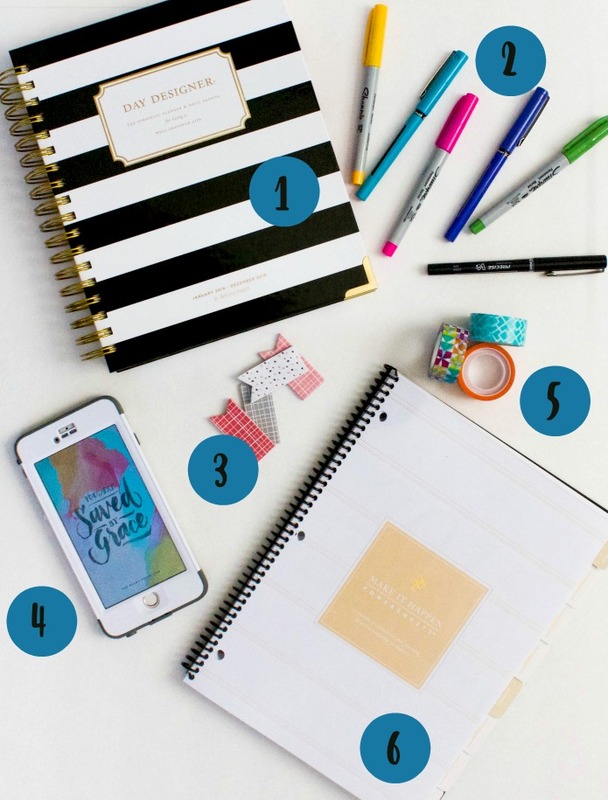 These 6 things are what’s going to help me stay on track this year! What tools do you use to keep you focused and organized? I think you’d love the powersheets, girl! I had a friend tell me about them last year and they’re pretty amazing! I agree that colorful pens make organizing so much easier! have you tried poppin pens? I have been wanting to but haven’t taken the plunge yet! I haven’t! I will have to check them out! :) Thanks for reading. fabulous! As a Mama of 4, I can always use more organization! :) Stopping by from the new Get it Together Link Up! Thank you, mama! Yes, I know I can always use it, too! :) Thanks so much for reading. I’m a total planner addict. I have a Plum Paper Planner with a blog planning insert but love the look of the Day Designer. I was just checking out the Powersheets on another blog this morning, maybe i’ll save that for next year! Stopping by from #bloggersgetsocial link party and hope you’ll linkup with our Small Victories Sunday Linkup too!